A wheelchair ramp is essential to travel and transport. Individuals who rely on the use of a wheelchair must be able to access a vehicle safely and confidently; most vehicles lack the proper equipment. Portable wheelchair ramps are a great alternative to purchasing a van with a wheelchair ramp or lift system already included. Maybe you’re a caregiver of someone who has recently started to use a wheelchair, or you’re not quite ready to buy a conversion van. A portable wheelchair ramp will help you with any transport situation, whether temporary or permanent. If you have already started looking for a wheelchair ramp for your van, you may be overwhelmed by the results or don’t know where to start. 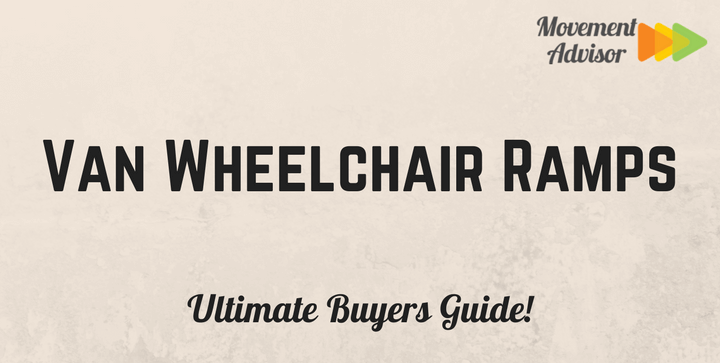 We will guide you through the process of selecting a ramp and recommend some of our favorite wheelchair ramps. Although a fully equipped conversion van is often an ideal vehicle for transporting individuals who use wheelchairs, it’s not a realistic investment for everyone. Maybe your elderly parent just started using a wheelchair, or you have a relative who uses a wheelchair and is coming to visit for a few weeks. Conversion vans can be costly, can change your insurance plan, and may not be necessary for someone who only needs to travel a few times a week. A portable wheelchair ramp for a van is just that, portable. They can be taken apart and stowed away in your van. A conversion van is usually completely customized for an individual who uses a wheelchair and can have modifications for a driver in a wheelchair. Portable wheelchair ramps are often more versatile and easy to use in a variety of vans. The weight capacity of your wheelchair ramp is important. Not only should it easily and safely hold the weight of a wheelchair, but the person who uses the chair. Additionally, look for models that can hold your weight if you will be assisting with entering and exiting the van. Keep in mind that an electric wheelchair will weigh more than other chairs; take this into account. Shorter ramps will result in a steeper incline, which can make it more difficult to get in and out of a van. The width of the ramp is also important to consider. While weight capacity is essential, don’t forget to see how much the ramp weighs. If you are the person setting up and taking down the ramp, you will need to be able to carry it safely. Selecting a ramp that’s even just a little too heavy can result in an injury. Always look for ramps that are easy to set up and take down on your own. Will the passenger using the wheelchair enter from the rear of the van, through the sliding door, or both? The point of entry and exit may be a determining factor when selecting a ramp. If you are planning to use both the back and side, you will need to make sure the ramp is easily stowed away, so it doesn’t act as an obstruction. If you are only planning to use the ramp in flat areas like parking lots or driveways the ramp you select may be different than the one you may use in areas with different terrain. It’s also a good idea to think about the climate. Do you live in a dry and warm region or one that experiences rain and snow? This portable and foldable wheelchair ramp from Prairie View Industries is available in 3 different lengths. The ramp is made from a high quality aluminum, which also makes it lightweight and easy to set up and put away. Each ramp size is designed for a wheelchair, power chairs, and even electric scooters. All models fold up, suitcase style, for easy and compact storage. There is also an integrated carrying handle. Each portable ramp comes with two steel security pins, a built-in level, and high traction grip tape. These ramps may assist in getting over steps, curbs, some stairs, and for side or rear entry of the van. This portable wheelchair ramp from Titan Ramps is made of aluminum, making it lightweight at 40 pounds. The slip resistant surfacing makes it an ideal ramp for any type of wheelchair, but the manufacturer does not recommend walking on the ramp. 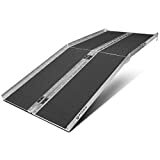 When fully extended, this portable ramp is 72”L x 30”W and is suitable for loading onto a variety of surfaces from porches and steps or into vans or pickup trucks. With a 2.5” angled lip with holes and pins to secure the ramp into place, transitioning from one surface to the next is smooth and easy. When folded up, suitcase style, the dimensions are 40”L x 15”W x 8”H and has a convenient carrying handle. The weight capacity for this portable ramp is 600 pounds. Similar to our previous picks, the EZ-Access ramp comes in two pieces and folds up compactly for convenient stowaway. When folded up, the ramp dimensions are 60”L x 15”W x 4.5”H. When completely set up, the lightweight aluminum ramp is 5 feet long and 29.75 inches wide. The transition plate, located at the base of the ramp, is self-adjusting which means it works on a variety of surfaces from a hard and level parking lot to an uneven lawn. Similar to other portable ramps, it has a non-skid surface and curbs on the sides to add a little extra security. The ramp also has a TOP Lip Extension. Although the ramp’s design is for use in vans and minivans, it can be used in other vehicles as well, such as trucks. It is also suitable to use on stairs and decks. Where other ramps have a weight capacity of 500 to 600 pounds, the EZ-Access ramp has a weight capacity of 800 pounds. Long ramp close to shorter size. Telescoping unlimited from 4.2 feet~ 10 feet. Safety ramp for SUV, kerb or stairs. FDA certification, Germany TUV GS-mark certification. Stainless steel lock clips designed by Ruedamann, lock ramp at any length. Super slip resistance, aluminum line with holes, keep water away. Carry handle, strong nylon material. Super portable ramp for wheelchair. If you have a van but are lacking space for some of the larger, foldable and portable ramps that we already mentioned, a telescoping wheelchair track ramp may be a suitable option. The Silver Spring Telescoping Wheelchair Track Ramps extend from 3 to 5 feet long and come with a convenient storage bag to bring with you wherever the wheelchair goes. Each aluminum ramp track is 7.5 inches wide and has a non-skid surface. For added security and stability, each ramp has top and bottom attaching lips and raised rails on the sides to prevent wheels from slipping off course. 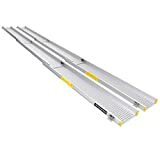 Similar to many other aluminum portable wheelchair ramps, these telescoping ramps are suitable for using with a van, curbs, and steps. The weight capacity is 600 pounds.